Sometimes it’s just a win ad in the local paper. Posted November 03, 2013 / Sometimes it’s just a win ad in the local paper. I’m not a baseball fan. I mean, it’s not that I don’t like it or enjoy a game at Fenway, I just don’t follow it. Never have. I am a huge fan of my home, though – my community. Every year, a baseball team wins the World Series, but it’s not always the story this year’s was. 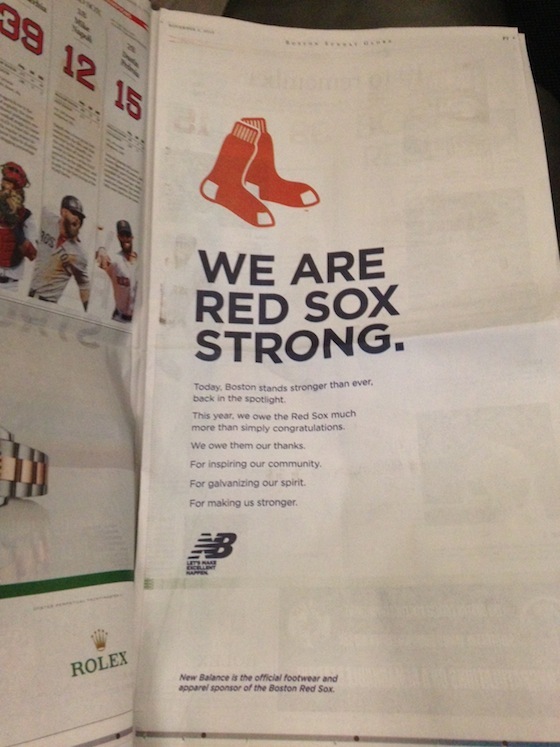 I wrote this win ad in the Boston Globe on behalf of our friends and partners at New Balance. It’s nothing fancy. Won’t win any awards for it. Still, it feels good to know where the words came from. I’m particularly proud of this project. It documents a local fitness movement that’s caught fire right here in our own back yard. November Project was started by a pair of former Northeastern University rowers, Brogan Graham and Bojan Mandaric, who simply wanted to motivate one another to get outside and keep moving during the bleak New England winters. In less than a year, it grew from a single-digit handful of participants into 300 to 500 per workout. Three days a week. 6:30 AM. Rain or shine, Hell or high water. 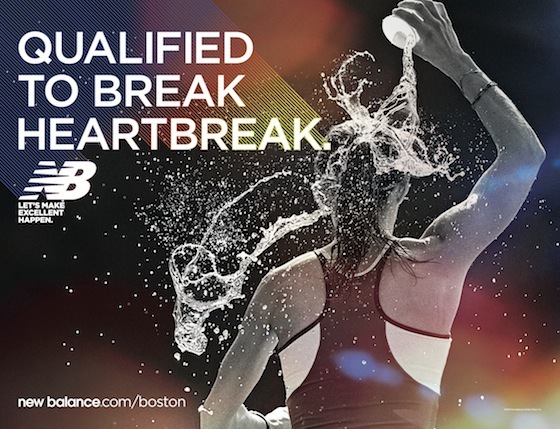 Along the way, they’ve been featured in Runner’s World, Outside Magazine, on NPR, and scores of other media outlets. Boston, for those who’ve never lived here, is an exceedingly insular place. It keeps you at an arm’s length. “Good fences make good neighbors,” goes the New England proverb. But November Project begins and ends with hugs. Sweaty hugs, no less. It’s about fitness, but it’s about community, warmth, and friendship, more than anything else. Birthdays are celebrated with crowd surfing. Workouts are concluded with group photos. Fierce competition and mutual encouragement are doled out in equal portions. You will laugh. You will dry heave. You will get stronger. 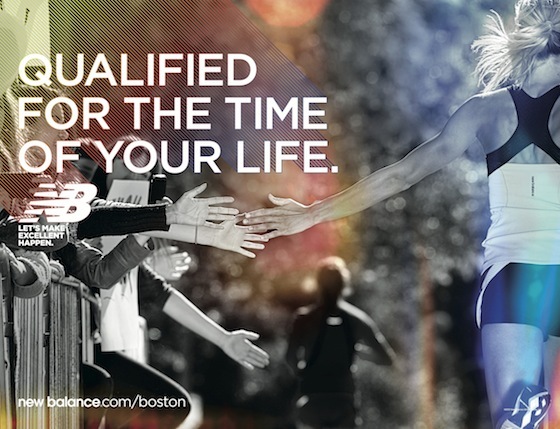 I love our partners at New Balance for getting behind this project and these people. When it comes to providing US manufacturing jobs, New Balance is the undisputed champion of the athletic footwear industry. Of course in this case, if they had some competition, everyone would win. A handful of actual American Associates help us make a point. When you’ve been making running shoes in America for the past 75 years – indeed, when you have been, and continue to be the only major athletic footwear brand to do so – where do you stand when President Obama, in his State of the Union address calls upon this congress to “…guarantee that the next revolution in manufacturing is Made in America”? Where do you stand when players like Intel, Apple, and Motorola earn plaudits as they proclaim their triumphant return to American manufacturing? Where do you stand when, by all indications, the biggest global player in your category seems poised to announce their own foray into the onshoring trend? 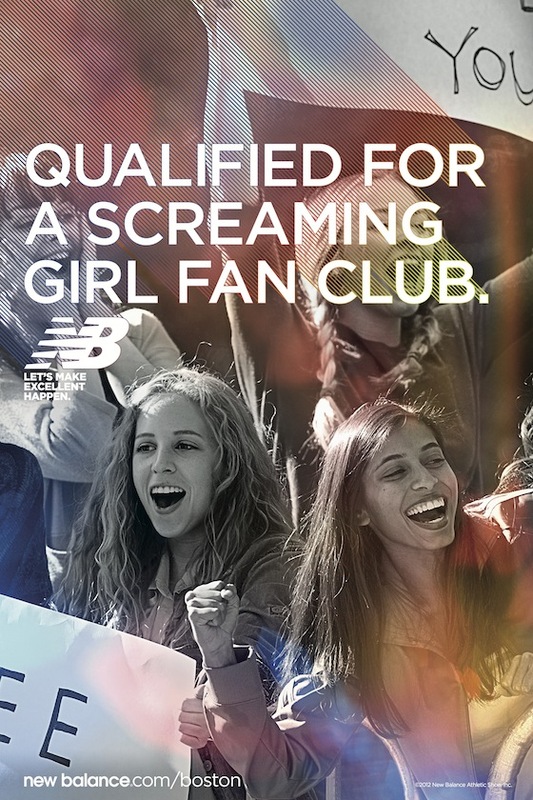 For New Balance, the answer is simple: You stand right behind it. Every bit of it. Every job created, every dollar injected, every quality product made with pride right here at home. Because it’s fine to be the only one doing a thing. But when it’s the right thing, you can only hope others will follow suit. And when they do, you welcome them home with open arms. 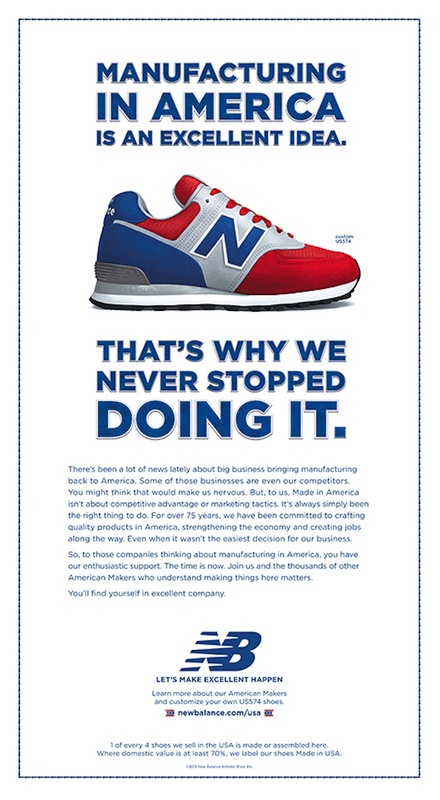 In the Summer of 2013, just in time for the Fourth of July, New Balance ran this ad in the New York Times and Wall Street Journal to make that position clear. April is an amazing time of year to be a runner in Boston. 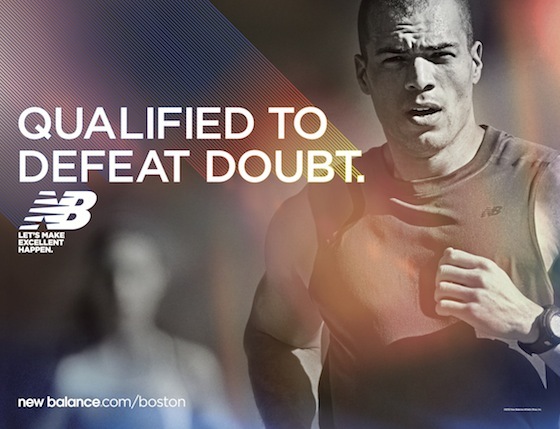 Read more about this New Balance outdoor campaign here. Having proven to himself that the barefoot-inspired Minimus from New Balance is indeed, “Like Barefoot, Only Better” our Minimus Man is back once again, and a little wiser for the wear. Now sporting both his left AND right Minimus shoes, his adventures bring him face to face with characters who’ve yet to discover the merits of the somewhat-less-than-barefoot life. 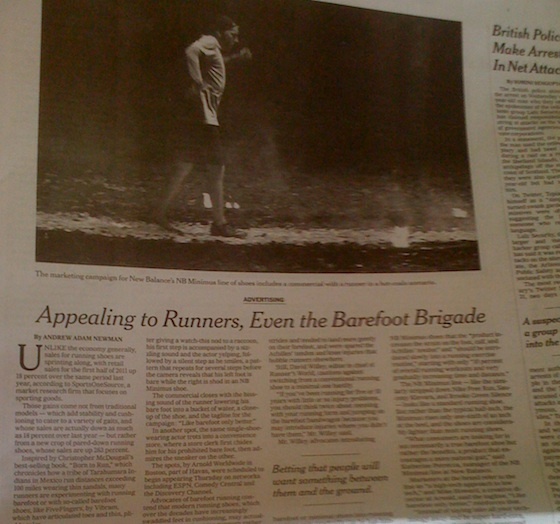 Super proud to see our work for the barefoot-inspired New Balance Minimus featured in a New York Times piece about the minimal footwear movement. Check out the full article. On one foot he wears the barefoot-inspired New Balance Minimus. On the other, he wears nothing at all. He’s a living, breathing, trail-running, side-by-side comparison. And his single-shod exploits prove that the Minimus is indeed like barefoot. Only better.